Keeping a sleep log or a sleep chart is one of the keys to getting a proper diagnosis of a circadian sleep disorder. Oftentimes someone will describe their sleep patterns, but it’s not always clear from the description when exactly they sleep. For example, someone will say they “keep going to bed later and later.” Depending on what they mean, that could either describe Non-24 Hour Sleep-Wake Cycle Disorder (N24) or a gradually worsening case of Delayed Sleep Phase Syndrome (DSPS). But a quick look at a sleep chart will usually clear up the distinction. My eponymous co-blogger Delayed2Sleep, who has, of course, DSPS, has posted several of her sleep logs. Today I am going to post some of my sleep charts. My name is LivingwithN24 and I have, you guessed it, N24. One thing I should note to start is that I have always charted my sleep on a vertical chart, whereas D2S has used a horizontal layout, so you’ll need to rotate the charts to compare them. 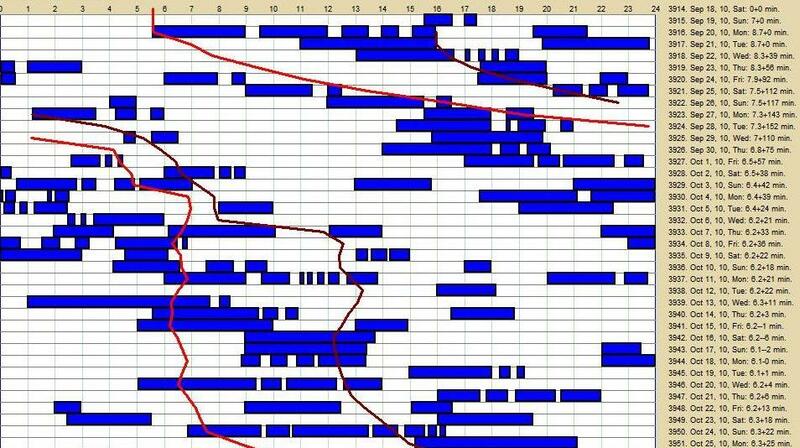 I have also “double-plotted” some of my sleep charts. That means each line on the chart encompasses 48 hours. That’s a standard method in sleep studies as it helps the patterns to stand out more clearly. I have had N24 for many years. 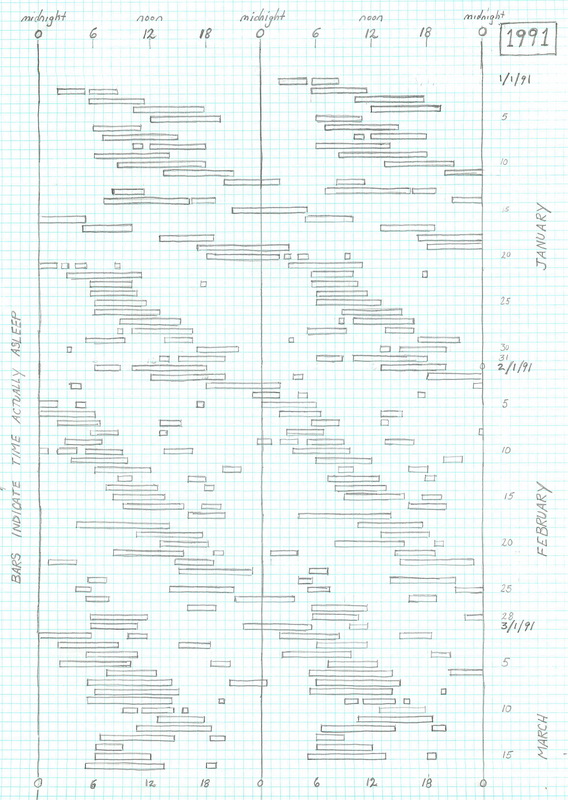 Here are two pages from a chart of my sleep I compiled in 1991. In those days I kept my charts on graph paper. These charts show a textbook case of N24. The phrase “textbook case” is not a metaphor here; the medical journal articles about my case are commonly cited in reviews of circadian sleep disorders. So there is no doubt you are looking at a case of N24 sleep. One can see that the sleep chart of an N24 shows a characteristic diagonal pattern as the bedtime and waking time slides gradually later each day. Unlike the case of DSPS, the delay does not stabilize at a particular clock time. Someone with DSPS may for example end up going to bed always around 6am for an extended period. Someone with N24 who goes to bed at 6am on Monday will likely go to bed at 7am on Tuesday, 8am on Wednesday, 9am on Thursday etc. until they have gone all the way around the clock. The delay is not always by one hour — I just chose that for simplicity. In my case I tended to delay 1.5 hours per day, meaning my “day” was actually 25.5 hours. One can see in this chart that there is some irregularity in the sleep times, and there may also be daytime naps. Both of these showed up a lot in January and February of that year. But there is a nonetheless a clear pattern to the sleep. In some months such as March, April and May it stands out especially clearly. It might also be of interest to compare these charts to another type of chart. In circadian medicine a technique called actigraphy is used. The patient wears a device called an actimeter on their wrist which records movement. Since people tend to move about a lot more when awake than when asleep, actigraphy can be a way of confirming the sleep times of a patient with N24 or DSPS. Here is an actigraphic chart of my sleep from around the same time as the sleep logs. 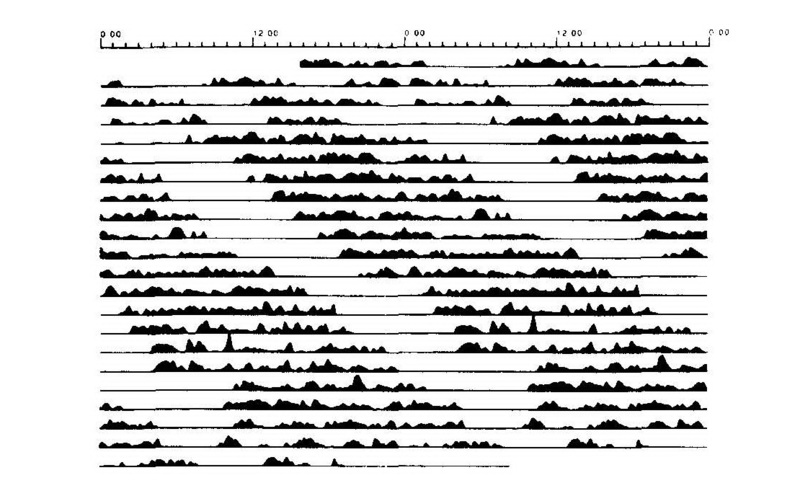 The difference is the black squiggles on the actigraphic chart show time awake, rather than asleep, but the same diagonal pattern is present. Now those charts are from 1991. The readers of this blog are clever folks and have no doubt noticed it is now 2010. I did this for a reason. Most of the studies of N24 have looked the subjects at one point in their lives. Few, if any, have examined how the sleep patterns of N24 change over the course of many years. I have noticed a number of changes in my sleep between 1991 and today. One thing I noticed is that it is much more difficult to control my N24 with lights, darkness and sleeping medications. In fact, over this summer it became impossible. So in September I stopped using the lightbox and the sleeping pills to see what my sleep would do on my own. 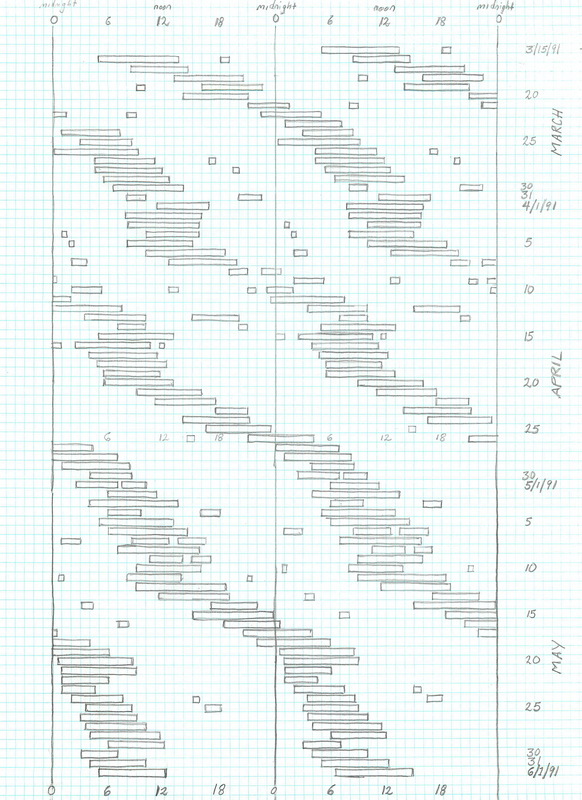 Here is a sleep chart I made for the last 5 weeks (Sept 18-Oct 25, 2010). Instead of making the chart by hand I used the SleepChart program from supermemo.com. This is quite different from the 1991 charts. While there is still a recognizable diagonal drift of the sleep times, it is much more erratic. The times of sleep are much less regular. Also there is a marked tendency to show two or more periods of sleep instead of one for each circadian day. In some ways this pattern of sleep is in between that of Non-24 Hour Sleep Wake Cycle Disorder and that of Sleep Wake Cycle Disorder – Irregular Type. In the irregular type of sleep disorder, the person sleeps at almost random times of day or night and for varying lengths of time. Usually there are several short periods of sleep scattered at various time around the clock. My sleep has not become completely irregular, but it is getting there. This is, to put it mildly, not a good thing. N24, bad as it is, has a least a little predictability to it. I could never predict my sleep out several weeks as some very regular N24s could do. But I could at least predict it fairly well 5 or 6 days out. Now I can barely predict what it will do from one day to the next and the urge to sleep or be awake comes upon me at almost random times. Usually irregular sleep patterns are associated with conditions involving brain damage (injuries, tumors) or deterioration (dementia). However I suspect that in cases of severe circadian disorder the circadian system may deteriorate over time, leading to an evolution towards an irregular sleep pattern. My co-blogger has remarked that her DSPS sleep has some irregular elements as well. Instead of a static snapshot of sleep which classifies the disorders as DSPS, N24 or irregular, research needs to look at sleep disorders as dynamic, evolving conditions. If someone has say, heart disease, we understand it will manifest itself differently at age 20 and 40 and 60. The same may be the case with circadian disorders. I had some sleep abnormalities from birth, classic DSPS from age 15 to 27, and N24 from then on. Now I seem to be trending towards irregular sleep. My approach to coping with this condition will have to change as well, but how that will happen I don’t yet know. I have so much to say about this post I don’t know where to start. I would like to contribute my own sleep charts, actiwatch charts and experiences, but I don’t know if that would work in the comment field. Perhaps as a guest blogger after submitting a post to your approval? So if your interested please take contact with me at the email address attached to this comment. Welcome, Arne! I’m sure we’d love to have you as a guest blogger, and we’ll get back to you on that. I agree! A guest blogger post would be great. Welcome aboard! I have straight DSPS, have kept a log for 10 days and wake up at 11-11:30 am naturally daily, no matter when I fall asleep, early or late. I bought a blue light from Phillips. They say I have a “mild” circadian rhythm problem, (because my goal is 9:30 am) and to look at the light at 11 am for 30 mins day 1. Look at the light at 10 am for 30 mins day 2, look at the light at 9:30 am 15-30 mins day 3+. This seems a bit too much like “set your alarm and get up early and look at a light and you will get tired and go to bed earlier the next night” kind of solution. I don’t know if it will change anything given how fast it is timed to shift a genetic predisposition. Do you have any sleep charts that are straight DSPS, not n24? Has anyone out there done this blue light thing? Are there logs for it’s efficacy? A number of people have used light treatment for DSPS. It works for some but not for others. In your case the regimen you describe is too fast a change. Even when light treatment is successful it rarely is able to advance the timing of sleep by more than 10 minutes a day. So you will need to take it much more slowly to have a good chance at success. My co-blogger has DSPS and has posted some sleep logs but her sleep is more irregular than most. If you are getting up more or less consistently at 11-11:30 I don’t think there is much doubt you have DSPS. Light treatment definitely can work — both on the basis of studies and the testimony of many people I know who have used it. On the other hand, there are many people with DSPS for whom it does not work. The only way to know for sure is to try. But take it slowly — that is the key. I started the blue light treatment 3 days ago, I used it after awakening naturally around 11 am. I noticed immediately a very adverse reaction. I became very agitated within 2 minutes of exposure. The full 30 minutes was almost unbearable. I have been hyper and miserable all day after the 3rd exposure. As I stated in an earlier post, melatonin makes me feel BAD when I take it. I spent all day researching this and it seems that exposure to blue light and darkness, (melatonin uptake) have a key role in mood disorders such as bipolar, (my father was bipolar and never slept, just napped. My niece has GAD since age 8). Blue light in the morning can bring on a manic episode, while total darkness, (i.e. sleep mask) may actually be a treatment for bipolar. Obviously DSPS and shifting my sleep phase is the least of my problems. However with these findings, it may be plausible that many people with sleep issues have some sort of mood disorder also. But which came first? The chicken or the egg? Did my genetic mood disorder screw up my sleep or did my lack of quality sleep cause my mood disorder? One final note: I walked in my sleep as a child almost every night. Maybe these 2 conditions are so intertwined they are impossible to diagnose separately, they may always occur together. I am going to try a sleep mask at night and blue light only in the early afternoon. If it makes me crazy again, I’m getting my money back for the $100 light. The light did have a warning: Do not use if you have bipolar disorder. A last note: I’m very displeased that on the same website that explained manic episodes in bipolars from morning blue light I took a quiz about DSPS and they recommended I awake at 8 am and look at blue light. Go figure. I see a sleep specialist on an irregular basis – irregular because he doesn’t feel there is much he can do for me at this stage. I also consulted a chronobiologist/clinical psychologist (the professional with whom I attempted chronotherapy) but subsequent consultations proved too expensive given the lack of progress we were making. As a postgraduate psychology student – after much toiling I finally managed to get through the honors year and am now attempting a PhD – I am very keen to find out everything I can regarding this condition. I am also thankful to have located others who reflect so much of my own experiences. PS If you would be interested in seeing my own sleep logs, I have three years worth in PDF form. Thank you for your comment, Andrew! It’s fascinating to see how parallel the course of our DSPS/N24 has been. I am glad that you have had an understanding parent and have been able to make so much progress in your studies. It is not easy to do with N24 and you should be proud. DSPS and N24 sometimes occur in conjunction with bipolar disorder. There has been some speculation that this can happen when a person’s mood cycles in a daily pattern so that they are depressed when they wake up and their mood improves, even to the point of hypomania, as the day goes on, leading them to have difficulty getting to sleep. Is this your pattern? I would be most interested in seeing your sleep charts and will send you an email about that. That’s very much the way my moods used to present. After 7am wake-ups I’d struggle through the morning in a dysphoric state, brighten up a bit by afternoon, then switch to a hypomanic state around 10pm, which of course interfered with sleep onset. After chronotherapy, the depression became more pronounced, with sleep debt precipitating some nasty melancholic episodes around sundown most days. It was after this that I started taking SSRIs, using a little xanax, and sleeping when my body dictated. This led to my being Non24, where the mood fluctuations are less extreme and less linearly related to sleep. Anyway, thanks for your response and warm words. I am encouraged by the intelligent, insightful approach the authors on delayed2sleep demonstrate. Its a saving grace with conditions like these. I am *THE* ADD Poster Girl, & have been dealing with N-24 since I was a little girl (I’m a Boomer) — about 25 years before ADD dx, so we can’t blame the stims. As I age, I find myself drifting toward ISWD (Irregular Sleep-Wake Disorder), despite the fact that I do my best to keep my wake-up time a ROCK SOLID noon, attempting sleep sometime between 4AM and dawn. Otherwise I have very few daytime hours to coordinate with the earthlings. My theory is that regulating my biorhythms (primarily bladder) helps to wake me up – otherwise I sleep right through TWO “bed-shaker” Sonic Boom alarms. I have always slept like the DEAD – impervious to sound. It’s been beyond tough to work with and around.. Only recently did I decide to go public. ACTUALLY, I sleep *better* on stims – Yale’s Thom Brown, following ADD and Sleep for may years, finds this not uncommon. On his recommendation, I now medicate 24/7. Ironically, when I do not take my “right before bedtime” dose, that’s when all @#$! breaks loose. Stupid oops thes past weekend, I awoke at 10PM — so I am now faced with attempting to rephase for the bazillionth time. It seems to take about 3 weeks every darned time. In any case, I just backlinked this post in the Related Content section at the end of my first person on my Attentional Spectrum focused blog, “Living with JetLag” – JetLagged for Life. It’s part of an ongoing Series on sleep, so expect more links. Nice to read a new post from this blog after all of this time. We are all still out here wide awake at 5 am. Tell me what is your appetite like? I seem to eat “lunch” around 5 pm. I can’t stand to even look at food before noon, assuming somehow I actually obeyed my alarm clock before noon, (not). It is getting later and later, worse and worse, of course EST to DST really screws the whole thing up even more. Just one more hour, please! I don’t have ADD but I do have anxiety and OCD. These things all seem to be very closely related. My father was bipolar, my sister has anxiety attacks. There really seems to be a mental health thread in all of these sleep issues. Madelyn, Welcome! I agree completely that there are often links between ADD and DSPS/N24/ISWD. Although I do not have ADD most of my close relatives do. Stimulants have a sedating effect on me, but since I don’t have ADD they just make me tired instead of more focused. Bu I have used stimulants (ritalin) at night as a sleeping pill and I do indeed sleep better. But I can’t take ritalin during the day is it makes me sleepy then, too! By the way you mentioned coming here from the NORD N24 report and via the CSD-N. I also happen to be the person who wrote the report for NORD. I am also the VP of the CSD-N and we had requested that N24 be included in the NORD database. It’s only been in there a couple of months now. The online N24 world is a small one. Judy, I am unusual in that I am most hungry when I first wake up. My breakfast is my biggest, and sometimes only, meal of the day. But more often people with DSPS or N24 have the opposite pattern. Like you they are not hungry until late in the day. History repeats itself … I was writing up an appeal after my health insurance turned down a prescription request for Nuvigil / Provigil, which I’ve been using once or twice a month when I need to function in my subjective night (my sleep doc had given me what proved to be a 2-year supply of samples). Googled non-24, found the NORD entry, signed up for CSD-N and Niteowl, and then found this blog. Right now my circadian day is 24.5 +/- 3.0. (Yes, that’s the actual standard deviation.) At times I’ve gotten the circadian drift down to under 10 min per day, but the irregularity has been constant for 25 years (and it’s frankly amazing to read someone else reporting what it’s like to live with that). That suggests a different etiology for the irregularity than you and the others who report a worsening with age, and in fact what turned my lifelong severe DSPS into N24, at age 34-5, was a few months where I got a provisional diagnosis of narcolepsy, of all things. I have way too much more to say! I trust if I introduce myself on Niteowl, you’ll see it? Hi, Eric. Some people with N24 seem to have very regular and predictable, albeit non-24-hour, cycles. But irregularity seems at least as common. It’s interesting that yours has not worsened over time. Some of the irregularity is what is called “relative coordination” — in which the persons delays slows when they are aligned with the day/night cycle and speeds up when not aligned. But a lot of it seems random. It’s not really surprising as the human body is not meant to free-run. A misdiagnosis of narcolepsy is not surprising. I had an MSLT done, and even when i am supposed to be awake, my sleepiness level is in the narcolepsy range. By the way, Provigil makes me more tired when used as needed. If I use it for a week it starts to have a stimulant effect but makes me intolerably nervous. So it’s not of much help to me. I am glad you get at least some help from it. I haven’t been as active on Nite Owl as in the past, but I will see if you post there. I am also in the Facebook N24 group. The most exciting thing, to me, in finding a large population of folks with severe DSPD or N24, is that my sleep difficulties got me interested in the brain, which led to being a non-degree pysch / neuroscience grad student for four years at Harvard, which led to my developing a theory of the fundamental roles of the six principle neuromodulators, and the personality traits that they mediate. This really seems to work, in that it’s predicted everything from the existence and efficacy of the ADD medication I’m now on myself (Strattera), to the degree that survey respondents liked the movie Cloud Atlas based on answers to questions as simple as “things remind me of other things all the time.” So I want to develop a combination personality and symptom survey and see if we can’t identify some speculative etiological clusters based on brain chemistry. Especially with serotonin, which we know inhibits the photic input to the SCN. My own levels seem to be extraordinarily high, and I don’t think this theory would exist if I didn’t have that clue from the beginning. I don’t recall reading of any human cases in which the two halves of the SCN cycle independently, but it does happen in hamsters under certain free-running conditions. I am glad you found the NORD article helpful. (As I mentioned in another comment, I am the first author listed). I’ve read some of your blog and may send you an email about it. My circadian neuroscience is 10 years out of date and/or dim in my memory! Last I can remember, there were no noradrenergic inputs to the SCN, but NE did have a major role in regulating melatonin production. And I’ve forgotten whether you could get an indirect affect on the clock by altering the latter. Strattera originally shortened my sleep, but I adapted to that, and it’s had no affect on my N24.